Staves are always enchanted and work as ranged weapons (i.e. magic bows); they cannot be used as beating sticks. Once the staff is completely discharged, it becomes unusable (save for blocking) and must be recharged using the same methods as any enchanted weapon, namely a Soul Gem, a Varla Stone, or a recharging service. This page describes the unique staves found in the game; a separate page (Generic Staves) describes the rest. Almost all staves have 100 health (exceptions are noted below), but generally the only time the health of a staff is relevant is if a Disintegrate Weapon spell is used. The spelling "Staffs" for the plural is used in-game, e.g. the shop Rindir's Staffs. This is a custom (and potentially powerful) staff obtained through a quest once you gain entrance to the Arcane University. After finding the wood you need for the staff (named Unfinished Staff) and taking it to the Arcane University, you get to choose what effects you want. You can choose one of three effects from three schools of magic (which gives a total of nine possible effects). Destruction gives you a "Mage's Staff of Fire", a "Mage's Staff of Frost", or a "Mage's Staff of Shock". Each causes elemental damage to the target. The magnitude varies with your level when you enchant the staff. Illusion gives you a choice between a "Mage's Staff of Charm", a "Mage's Staff of Paralysis", and a "Mage's Staff of Silence". Mysticism gives you a choice between a "Mage's Staff of Dispel", a "Mage's Staff of Soul Trap", or a "Mage's Staff of Telekinesis"
* These Mage's Staves are the only ones in the game that do not have 40 uses. This is caused by the magnitude of the staves' spell not being consistent with its charge. ¹ The charge for this stave should be 960. This bug is fixed by version 1.6.0 of the Unofficial Oblivion Patch. ² The spell on this stave should be a 20 foot spell lasting 10 seconds, rather than that of the level 5-9 version. The level of the finished staff is determined by your level at the moment when you return to pick up the completed staff. It is possible to hand in at a lower level and pick it up once you've reached one of the boundary levels. WARNING: Do not speak with anyone about the staff and do not open the cupboard in the Chironasium until you are ready to pick up the staff. Doing so seems to lock the staff's level into place. The 1.2.0416 patch may 'correct' this, and fix the level of the finished staff at the moment you choose the enchantment. All Mage's Staves have a weight of 10. If you do not intend to keep the staff, be aware that the monetary value of the staves varies widely depending on the type you create. The bold numbers indicate the highest values for a Mage's Staff at that level. Mankar Camoran's Staff is used by Mankar Camoran, who is encountered during the Main Quest. 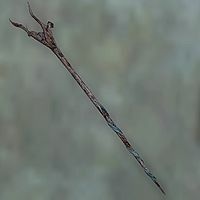 In appearance, it is identical to a typical staff. For full leveled statistics see the Mankar Camoran's Staff article. The Staff of Indarys is one of the possible rewards given to you by Count Andel Indarys for completing the quest The Wayward Knight. You get to choose whether to receive this staff or Thornblade. For full leveled statistics see the Staff of Indarys article. 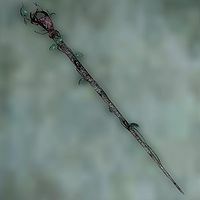 Staff of Nenalata may be found (or destroyed) during the quest Secrets of the Ayleids. In appearance, it is identical to a typical staff. For full leveled statistics see the Staff of Nenalata article. These are all of the other unique staves in the game. 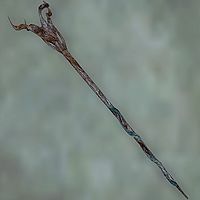 Generic staves (i.e., those that are found in random loot) are all listed at Generic Staves. Many of these staves have individual articles that provide more details, as indicated by the links in the following table. Shock Damage 33pts 3000/250=12 3500 For sale at Rindir's Staffs in the Imperial City Market District. Combined with a brief 100% Weakness to all three elements spell this staff can be very powerful, doing nearly 200 points of damage. 00066C45 Shock Damage 5pts 150/9=16 188 Found on the Goblin Witch during Tutorial. Chameleon 1% for 30sec 1000/97=10 1239 Stolen from the Arch-Mage's quarters during the Misdirection quest for the Thieves Guild. The first ID (00002DDF) refers to the staff that exists during the quest (which is a zero-weight quest item). After the quest the first version disappears, and the second one (ID 00047372) appears in the Arch-Mage's quarters. 0002C6A8 Charm 10pts for 10sec 350/5=70 192 You need to retrieve this staff during the Bravil Recommendation quest. It has the same power as a low level Charm staff you can get for yourself, (see above) but with more charges. 0001FB1C Drain Health 20pts for 10sec 2000/31=64 912 Not found in-game. Appears to have at one time been related to the Dagon Shrine quest. 000228EF Sanguine Rose 3000/300=10 1330 Reward for completing Sanguine's quest. 00027116 Corruption for 30sec 3000/150=20 1270 Reward for completing Vaermina's Quest. 0001CECC Fire Damage 40pts 500/63=7 325 Carried by Lorgren Benirus, the lich responsible for the haunting of Benirus Manor in Anvil. See Where Spirits Have Lease for details. 0004F790 Summons four non-hostile scamps who will follow the owner everywhere until the staff is dropped (except the staff can't be dropped). N/A 0 Rosentia Gallenus in Leyawiin can't get rid of it fast enough. See Whom Gods Annoy for details. 0004A24E Reanimate for 30sec 5000/22=227 0 Held by Mannimarco, King of Worms, who is encountered during the Mages Guild quest Confront the King. 000355A6 none N/A 50 In a chest on the Isle of Wellspring. Found during the A Mage's Staff quest. Used to create your own Mage's Staff. This staff has unusually high health (900); but after being transformed into your Mage's Staff it has 100 health. 000228F0 Wabbajack 3000/300=10 1330 Reward for completing Sheogorath's quest. This page was last modified on 11 January 2019, at 13:13.